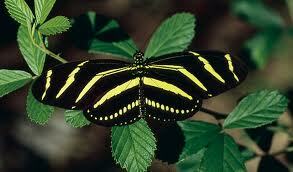 The Florida state butterfly is the Zebra Longwing. Long black wings with distinctive thin yellow bands – combined with slow, graceful flight – characterize the zebra longwing. It has a wide range of habitats, including hardwood hammocks, thickets, and gardens. The adult Zebra Longwing sip sweet nectar and pollen from lantana and shepherd’s needle. They fly slowly and gracefully and are not easily startled. The zebra longwing is found throughout the state, although it is more common in south Florida, particularly in the Everglades National Park. In 1996 the state legislature designated the zebra longwing as the official state butterfly.